Keep your dog’s vaccinations up to date. Always supervise pets when outdoors, particularly at dawn and dusk. Avoid going near den sites and thick vegetation. Do not allow dogs to play with or chase wildlife. It is against Massachusetts law to allow dogs to chase or harass wildlife. Keep your dog leashed and under control. Always give the wild animal a clear escape route. Do not crowd the animal; doing so could make it stressed and unpredictable. Stay calm, do not run. Pick up small pets and children. Appear as big and as loud as possible. Stomp your feet and clap your hands. Shout in a loud, authoritative voice. Throw sticks or rocks at the animal if it approaches. Porcupines: The quills are barbed and can embed in the skin, then work their way in. Consult a veterinarian to have the quills removed from your dog. 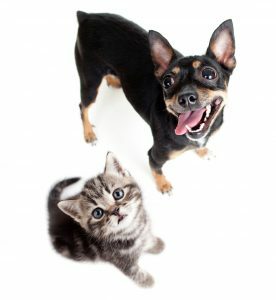 If your pet is bitten, consult a veterinarian to have the wound treated as soon as possible. If you have an encounter with aggressive wildlife, please alert the MA Division of Fisheries and Wildlife office near you. If the encounter occurs after hours or on the weekend, please call your local animal control officer, police department or county sheriff’s office, who can contact a conservation officer to handle the situation. Contrary to popular belief, cats hunting wildlife is not “natural.” Cats have been domesticated for thousands of years and were brought here by European settlers. They are not “native” wildlife and therefore when they kill native species, they are disrupting the ecosystem. House cats, due to their predatory nature, do pose a threat to wildlife populations such as songbirds and small mammals. Free-roaming house cats can be an attractant to bring wildlife, like coyotes, into a neighborhood. The cats themselves are often at risk of being preyed upon by larger predators like coyotes, foxes, raccoons, cougars, skunks, raptors and domestic dogs. The human safety risk is higher once wild animals find a food source close to urban areas. Cats can also contract diseases, such as rabies, from coming in contact with wildlife. When acquiring a new cat, keep it inside from the start. Gradually decrease the amount of time your cat spends outdoors and increase the time indoors. This may be easiest to do during the winter months. Provide indoor activities such as cat condos, window perches, interactive toys, and scratch posts. Offer fresh cat greens often. Provide an outdoor enclosed and covered room, patio or run. The cat can access the safe outdoor area through a cat door or window door. There are several commercial cat runs and outdoor cat exploring cages available at pet supply companies. Do not let pets outside at night. Provide a reflective collar with identification and a bell to warn wildlife of the cat’s presence. Keep cats indoors during the spring baby bird and mammal season. Trim your cat’s nails every one to two weeks. Note: If behavioral problems arise once a cat is denied access outdoors, they can usually be attributed to boredom. Be patient and review the steps you took to keep the cat indoors. Talking with your veterinarian or a cat behavior specialist can be helpful.